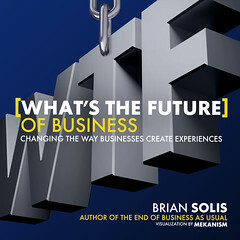 When writing my new book, What’s the Future of Business, Changing the way businesses create experiences, I felt that text wasn’t enough. So, I sought the wit and creativity of my good friend from the ole Web 2.0 days Hugh MacLeod aka @gapingvoid to help summarize each chapter in the form of a toon. Then we got to talking, why limit the cartoons to just the book? Hugh MacLeod is not only a dear friend but also one of my biggest inspirations. His artwork is a magnificent harmony of emotion, wit, logic and satire. When I thought about the future of business, I pictured it beyond words on a page, I hoped to bring together art with the art of storytelling. I couldn’t think of anyone other than Hugh to visualize what the future (WTF) is and should be. As such, we decided to free them from the confines of bindery and instead stitch them together in this free Slideshare. We’ll be releasing each of the individual graphics and the story behind them over the next few weeks. I hope you are inspired by his work the same way I am. Number 1: The Internet is very big and it basically wants to kill you. The internet is a global system of interconnected computer systems blah blah blah where www stands for both World Wide Web and Who Where Why. The way I look at it is a collective of people, data, and things. Understand that it is what it is. But its true nature and potential are yours to define. It just takes mastery of the “5I’s”. Squeeze intelligence out of information. Translate insights into ideas. Enliven ideas through Interactions. Influence behavior and inspire new possibilities. Note: Slideshare will ask you for an email address, which unlocks a free download. Brian I like what you and Huge did. The art of storytelling with visual cartoons, Visualize, Conceptualize and Recognize the future of Business.. Thanks Doug. Hope you’re well! This is great! I love how you guys teamed up and used visuals to explain the future and where it is going with the internet. Sometimes all we need is some visual behind words to really get our minds comprehending what is being said. Pictures help me think more conceptually about things. The most important thing I will take from this first cartoon is to “squeeze intelligence out of information”, as I think that a lot of the time we get caught up in the noise through the internet and don’t pay enough attention to the stuff that will actually benefit us. Love this, thanks for sharing. I think that this is awesome! Love this idea,its not only creative but smart because it draws peoples attention. For me I really enjoyed this because I have always been a visual learner. Seeing a picture and having words at the same time makes it easier for me to understand what is going on. With having a visual I tend to be able to comprehend things better versus not having one. Thanks for sharing! Brian: What a great idea! I agree that visuals add so much value to text and words alone. Not only are visuals more attractive to people, but they also make everything easier to understand. It kind of goes along with the recent, spiked popularity of info-graphics. Its like when authors use imagery to try and bring the reader into the story. Instead of spending an entire page trying to fully describe a scene, a photo could make up for that space, and so much more. As far as using cartoons, I think the idea is genius because they are both entertaining and memorable. MacLeod’s work is simple, creative and effective. Hannah, I love that! Social media really is like a game of telephone. Thanks for helping me put a visual to it and making my mind think in a different way. Thank you, Gabrielle! 🙂 Being part of a class that’s all about social media helped me come up with that connection. It’s crazy how social media acts as the gatekeeper for so many ideas and thoughts among our society. What’s the Future of Business is not only full of thoughtful advice & information, but it is also an example of why some physical books will survive into the digital age. Because you can read it online, but you will want to buy the printed copy. The visuals and cartoons are only one aspect of why it is awesome. Skip, this means a lot. Thank you. I love the visual you use about young people being so influential in the online world. Its so true, no one has a better grasp on the online world. But what an interesting way to add perspective to all your thoughts. These are great! Brian, the cartoons in combination with your insights are excellent. Thanks so much!